Once people get over their initial impressions of a material, innovation usually begins to occur. But, when a product is unique, while at the same time sharing so many traits with a material people are more familiar with, what may seem like a logical application for memory foam may actually be a poor fit. Possibly the biggest question we get at The Foam Factory regarding memory foam has to do with finding the right thickness in bedding, and why we construct our memory mattresses in the style we have chosen. Let’s take a look at both right now! To start, the single biggest fact to keep in mind with memory foam is that it is intended to be used as a comfort aid. Memory foam is able to support lower-pressure areas of the body, but when you compare it to a firm, high-ILD conventional foam like The Foam Factory’s Lux High Quality, you see a stark difference between the softness of the memory foam and the firm cushioning of the Lux. 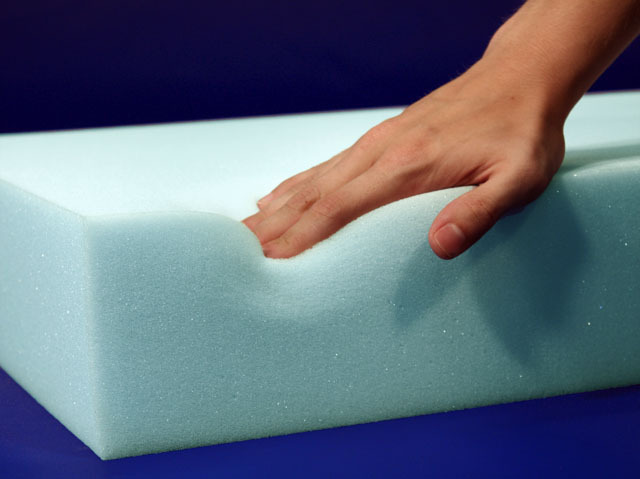 Memory foam behaves more fluidly than conventional foam as well, which is mainly in reference to its viscosity. This works when body heat activates the material, allowing it to soften, which permits additional contouring as pressure is applied from the body. When dealing with conventional foam, “max compression” (unofficial terminology) is eventually reached when the body starts sinking, and is supported by the dense, compressed foam. Memory foam allows you to sink more deeply, as it is a reactive material. Your body softens deeper areas of the material, and you sink in farther, because the softened areas are less resistant to pressure. Eventually, memory foam hits that “max compression” point as well, but it’s beyond where your body is being evenly supported and kept in alignment. This is the reason 3″ or 4″ is usually the max thickness for memory foam bedding layers. So how is it that tens of thousands sleep like a baby on a material that seems like it would act like quicksand? This leads us to our main point – mattress layering. Because memory foam possesses the ability to soften and yield to pressure, the material needs a non-reactive base layer that will act as reinforcement and support for the body. These base layers are firmer than memory foam, but being foam, are still soft enough to cushion and be comfortable. Conventional foam can be had in variable firmnesses as well, giving people the opportunity to create a comfort and feel perfect for their needs. This is the same idea that applies to memory toppers, where your existing mattress is what serves as the base layer beneath the memory foam. The sweet spot for the majority of people falls into the 2″, 3″, or 4″ range for memory foam thickness. People can be skeptical of this layering method, because on the surface, it looks like they’re getting shorted on “the good stuff” – the memory foam. In reality, the layered approach offers better comfort, support, and bang for the buck than a full slab of memory foam. The main reason for layering goes right along with the softening and support traits of the material mentioned earlier. If you have 10″ of solid memory foam, you will sink deeper and deeper, as your center of weight warms, then softens, the foam. At the same time, your extremities won’t be sinking as deeply as your core, due to their lighter weight. You’d lack balanced support and would likely have aches and pains from your head to toes from the misalignment, if you even got to sleep in the first place. If you’ve ever rested on a sagging, old, innerspring mattress, you’ll recognize the feeling, and it is amplified in too-thick memory foam. Dividing a foam mattress between memory and conventional foam gives you the right blend of comfort from the memory and support from the base. Secondly, even in the event that a 100% memory foam mattress didn’t come up short in comfort, a mattress made of that much specialty material would be incredibly cost-prohibitive. The same 10″ mattress that would have sucked you into its form with no support could be double or even triple the cost of a 10″ thick mattress, with that height divided between a memory comfort layer and a conventional base. When layered correctly, the additional cost of memory foam is more than warranted, but if used in an “overkill” sense, you’re paying more for a poorer end-result. Memory foam is a terrific and innovative material, but being new on the market compared to some tried-and-true products, some people are still figuring out how it works and the best way to implement it. In the case of memory foam mattresses, layering memory foam with conventional foam leverages the maximum benefit of both materials, in a product that gives you maximum comfort and support at the best price, while avoiding the materials’ drawbacks.